BRGY. MAGSAYSAY, Lope de Vega, Northern Samar – The troops of the 20th Infantry (We Lead) Battalion, 8th Infantry (Stormtroopers) Division, Philippine Army conducted a caravan for Secured and Fare 2013 Election (SAFE 2013) last 07 May 2013 in the areas of the 1st District of Northern Samar. LTC Noel Vestuir, 20IB’s Commanding officer in his press statement, stated that: “the purpose of the caravan is to encourage the populace to exercise their right of suffrage, go out and vote this coming May 13, 2013 elections. According to Vestuir, his troops are now ready to provide security assistance to ensure that the conduct of election, as well as the final testing and sealing (FTS) of PCOs machines are secured. As earlier reported armed NPAs are intimidating the voters and forced them to vote their favored candidates. The armed NPAs are also threatening and harassing the candidates by enforcing their Election Access Fee (EAF) in the remote barangays. However, due to the sustained conduct of combat clearing operations, these threats have been preempted. Through the said operations, a total of five (5) abandoned NPA camps has been discovered by 20IB troops in the hinterland barangays of San Isidro, Allen and Victoria all of Northern Samar starting March this year. 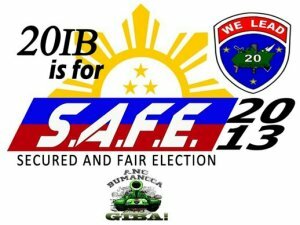 The SAFE 2013 Caravan started from 20IB headquarters in Lope de Vega town, Catarman, Bobon, San Jose, Rosalio, Lavezares, Allen, Victoria, San Isidro all in the first district of Northern Samar Province down to Tinambacan and Oquendo districts of Calbayog City. The caravan followed the Catarman-Lope de Vega road otherwise known as the south road and Maharlika Highway from Catarman-Allen and Allen to Calbayog City. “Through the conduct of SAFE 2013 Caravan, the people are now aware that they could freely exercise their right of suffrage knowing the fact that government security forces are now ready to perform their mandate of securing the people”, Vestuir concluded. CAMP KANGLEON, Palo, Leyte – The police have filed criminal charges on Friday against two people tagged as responsible for a gun attack that injured a town mayor and his son in Northern Samar. Eastern Visayas Police Director Police Chief Superintendent Elmer Ragadio Soria informed that two cases of Frustrated Murder charges were filed before the Office of the Provincial Prosecutor in Catarman, Northern Samar against Albert Kennedy y Bolon and Precillano Aliganza y Peñaflor under NPS Docket No. VIII-II-INQ-13E-00018. “The suspects were positively identified by witnesses as the assailants in the Thursday night shooting that wounded Victoria town Mayor Jose Ardales and son Jorge,” Soria said. The two were tagged as responsible for the gun attack around 8:00 Thursday evening while the victims were crossing the pathway along San Joaquin St., Barangay Zone 1 Poblacion in Victoria town to verify a gun burst they heard from the compound of Guillermo Jumamil, the mayor’s political opponent, that resulted in the wounding of the elder Ardales on his neck while his son was hit on his abdomen. The suspects rushed inside the compound of Jumamil, who presented the duo upon request from police authorities, and were immediately brought to Northern Samar Police Provincial Office for investigation. The victims, meanwhile, are confined at Catarman Doctor’s Hospital and are now reportedly out of danger. The mayor, who was preventively suspended by the Sangguniang Panlalawigan in Northern Samar due to an administrative case, is running for reelection under the National Unity Party (NUP). But despite of the incident, the situation in Northern Samar is within manageable level, according to Soria. “This will not affect the peaceful conduct of electoral proceedings in the area or in the entire province,” he said. A police team from the Northern Samar Provincial Public Safety Company (NSPPSC) were immediately augmented to Victoria Police Station on Friday while additional one team from the Regional Pubic Safety Battalion 8 (RPSB8) were deployed in the area aside from one section from the Army’s 803rd Brigade. “The augmentation is done to prevent the occurrence of similar incident in the area as well as to maintain peace and order as the election day draws near,” the police regional chief added. A total of 235 police personnel were augmented to Northern Samar in line with PRO8’s campaign for a secured and fair midterm elections. The National Democratic Front-Eastern Visayas condemns the attempted assassination last May 2 of Jose Ardales, the incumbent mayor running for reelection in Victoria, Northern Samar and an opponent of the Daza political dynasty in the province. While the People's Democratic Government is still investigating the issue, it is clear that the victim is staunchly opposed to the Dazas and is currently undergoing political harassment by them. The attempted assassination is also another mark on the long list of extrajudicial killings and other acts of political violence in the province, which the Dazas are accused of being behind to protect their political and criminal interests. The NDF-EV is thus sending an ultimatum to the Daza political camp to abide by the guidelines of the People's Democratic Government on the reactionary elections, specifically the prohibition of armed violence against political rivals and the people, as well as of widespread cheating. Congressman Raul Daza and his son Gov. Paul Daza should be mindful that they are already being investigated by the revolutionary justice system for plunder, widespread corruption, criminality, and impunity for extrajudicial killings and other human rights violations. It will not matter whether they win or lose in the elections; they will surely undergo due process and be made to account before the people's court. The NDF-EV also slams Gov. Daza for making provocative statements against the revolutionary movement in support of the Aquino regime's ditching of the peace process with the NDFP. Even though he has not even secured his reelection, Gov. Daza is already boasting of securing P50 million for “peace and prosperity roads” that are really meant for the “counterinsurgency” operations of the 8th Infantry Division. This means expressing full support for the Aquino regime's unilateral ending of peace talks with the NDFP and gunning for all-out war through the Oplan Bayanihan of the Armed Forces of the Philippines. Therefore, the NDF-EV reminds the Dazas of the gravity of the charges against them. The burden is on the Dazas to refrain from brazen acts against the people and the revolution, and to show as well their accountability and willingness to reform. But if they continue to show impunity, they will only give just cause for the People's Democratic Government to act with appropriate measures to speedily bring them to revolutionary justice. All candidates in the reactionary elections are enjoined to respect the guidelines of the People's Democratic Government that have been made clear to them. They should not use goons or state security forces to terrorize the people. They should not bribe or cheat to corrupt and divide the people. They will be made to account before the people if they fail to do so. TACLOBAN CITY – The Commission on Elections reiterated that all policemen detailed to local officials as protective security personnel during the election period must always be in uniform. Lawyer Veronico Petalcorin Comelec Region 8 acting Director made the reminder during a recently-held media interaction at the PIA Regional Office. Petalcorin added that only incumbent lawmakers and governors are allowed to have police and military security escorts during the 2013 election period. He said this is contained in Comelec Resolution 96-08 which provides that incumbent governors and congressmen are allowed two PNP/military security details and two more security guards. He said those running for governor and congressman who are not incumbents are not entitled to police or military bodyguards. Petalcorin said that Republic Act 7166 otherwise known as Synchronized National and Local Elections and For Electoral Reforms provides that police personnel assigned to local officials should be uniformed, their name, rank and serial number written legibly and visible at all times. Local elective officials have to ensure that their official police security escorts are in their prescribed uniform in order to avoid outright termination of the protective security services and possible administrative and criminal charges against the PNP personnel, Petalcorin added. Incumbent vice governors and local officials seeking re-election or running for other elective positions and candidates for the 2013 elections can have only two blue guards for security. However, even these have to pass through the Comelec, with details like firearms being carried by the blue guards as well as photos of their uniforms, Atty. Petalcorin said. He added that blue guards who will be detailed as security of candidates will have to present accreditation that they have passed VIP protection training course. Moreover, Petalcorin stressed that barangay officials, including government employees, are not allowed to take partisan political activities in this election. He called on the people to report to the Comelec and its deputies any barangay official or government employee undertaking partisan political activity so that they can be charged for violation of the election code. CAMP KANGLEON, Palo, Leyte – One hundred forty seven out of 355 or roughly 41 percent of the personnel of Police Regional Office 8 (PRO8) who registered as absentee voters casted their votes in the local absentee voting ahead of the May 13 midterm elections. Notwithstanding the turnout, PRO8 Director Police Chief Superintendent Elmer Ragadio Soria stressed that people in Eastern Visayas are assured of the PRO8’s maximum service on election day as some of its personnel need not to compromise their democratic right in order to perform their crucial role of ensuring the electorate in the midterm polls. “Much is expected from us in the elections in terms of safeguarding peace and order, so the Comelec included the PNP among the organizations that practiced absentee voting along with AFP and other media practitioners,” Soria said. PRO8 personnel who availed in the local absentee voting exercised their rights of suffrage from Monday up to 5:00 P.M. Tuesday at the designated polling center at PRO8’s Matapat Hall in response to Comelec Resolution No. 9637 promulgated last February 13. Majority of absentee voters are PNP personnel assigned at the Regional Public Safety Battalion 8 (RPSB 8) with 116 voters followed by those assigned at stations in Leyte province with 12 voters. Personnel from PRO8 headquarters and Eastern Samar have 8 voters each and those coming from the cities of Tacloban, Ormoc and Catbalogan had one voter from each city. Local absentee voting refers to a system of voting whereby government officials and employees, including members of the Armed Forces of the Philippines (AFP), and the Philippine National Police (PNP) as well as members of the media who are duly registered voters, are allowed to vote for the national positions and party-list representatives in places where they are not registered voters but where they are temporarily assigned to perform election duties on election day as provided for under Executive Order No. 157 and Republic Act No. 7166. Policemen who are eligible absentee voters that failed to vote during the two-day period can still vote in the May 13 elections. Meanwhile, Director Soria informed that PRO8 will be deploying 763 more personnel on Friday to augment the provincial and city police offices’ as security forces in pre-election police activities and in securing polling centers on election day. PRO8 earlier deployed 50 personnel to Calbayog City last week and 267 cops to the three Samar provinces on Monday. “We are now in the homestretch of our security preparations and we will ensure a secured and fair elections in the region,” Soria averred. The statement from Marie Hilao-Enriquez, chairperson of Karapatan, was a reaction to GPH peace panel chair, Alex Padilla “who threw a tantrum before the media and unilaterally declared the collapse of the peace talks between the GPH and the NDFP.“ Hilao-Enriquez is an independent observer to the peace negotiation between the GPH and the NDFP. Padilla’s statement, Hilao-Enriquez said, “reflects the Aquino government’s position on the peace negotiation with the NDFP. The GPH’s sincerity to resolve the causes of the armed conflict is questionable from the very beginning.” Now that the self-imposed deadline of rendering the CPP-NPA-NDFP insignificant in 2013, the Aquino government’s accusation that the NDFP is not intent on the peace negotiations provides it with a very convenient excuse to scuttle the talks and resort to war, Hilao-Enriquez added. 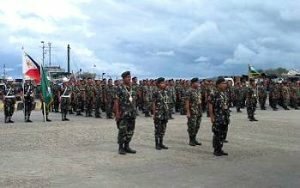 KANANGA, Leyte – The 19th Infantry (Commando) Battalion deployed at least one hundred (100) soldiers to boost the number of government forces who shall secure the upcoming local and national election in the province of Biliran. This after the send-off ceremony held at Philippine Ports Authority, Naval, Biliran around 7:00 a.m. on Wednesday, May 2, 2013. Police and soldiers along with one (1) simba fighting vehicle (SFV) and five (5) KIA M450 light trucks paraded the streets of Naval, the capital town of Biliran. The activity kicked off the COMELEC and election deputies’ task to maintain a Secure and Fare Elections (SAFE) 2013. Lt. Col. Joel Alejandro Nacnac, commanding officer of 19th IB said the move to dispatch soldiers in the province was earlier agreed by the COMELEC and election deputies as a pro-active measure against any unforeseen event. “It may look awkward to the public, considering that the province of Biliran had been declared as insurgency-free on 2006. But the beefing up of the current number of security forces in the area is only to ensure unhampered conduct of election and that the public is never deprived of their right to suffrage”, Lt. Col. Nacnac said. As election deputies, the military and police will be conducting checkpoints especially in areas which are considered as election hot spots. Troops will also be detailed to secure polling places at least a day before election and will withdraw thereon until all PCOS machines are turned over to the COMELEC. Col. Rafael C. Valencia, Commander of the Ormoc City based 802nd Infantry Brigade has standing order to all soldiers who will be assigned to secure polling places and even those who are conducting checkpoints to be non-partisans. The military however is encouraging the public to go out and cast their vote on election day. CAMP KANGLEON, Palo, Leyte – The Police Regional Office 8 (PRO8) is confident of a peaceful conduct of the midterm elections in Eastern Visayas in spite of a shooting incident in Calbayog City on Tuesday afternoon resulting in the death of a village chair and the wounding of two others. “Eastern Visayas remains peaceful less than two weeks before the elections. Continuous implementation of election-related security measures is being undertaken by our men,” said Police Chief Superintendent Elmer Ragadio Soria, PRO8 Regional Director. Soria made the assessment amid a shooting incident in Calbayog City in Samar’s first district resulting in the death of Brgy. Bagong Lipunan chairman Amado Lauyon and the wounding of his son, Rindo, and by-stander Donie Palomas. “This is an isolated incident and it will not in any way affect the electoral proceedings in the area or create a form of political tension that could eventually upset the electoral process,” he added. Reports reaching PRO8 disclosed that Lauyon was waylaid along the national highway in Purok 1, Brgy. Matobato, infront of Matobato Elementary School, by riding-in-tandem suspects and sustained several gunshot wounds on different parts of his body resulting to his immediate death. His son, Rindo, also a village councilor, and Palomas, were also wounded in the incident. Police are now preparing murder and frustrated murder charges against the suspects, identified by witnesses as Reynaldo Dealagdon alias Bolon, Eddie Fermino alias Bolondoy, and three others who are now the subject of manhunt operations. It was also learned that suspect Dealagdon has a pending arrest warrant for murder. The elder Lauyon is listed as a member of the Montealto private armed group who surrendered to PNP Chief Police Director General Alan LM. Purisima when he visited PRO8 headquarters last January 19. Soria also directed a thorough validation if the case could be classified as election-related incident or due to other reasons like personal motive or vendetta attack. Relatedly, the police regional director has ordered a stepped-up campaign against wanted persons, partisan armed groups and loose firearms in Samar and other parts of the region. So far, PRO8 had already arrested 117 individuals, mostly civilians, for violating the gun ban, the latest of which was the arrest of three persons – Diego Calagos, Ireneo Dealagdon and Cezar Saloritos – in a Comelec checkpoint in Brgy. Balud, Sta. Margarita, Samar past midnight Tuesday. Policemen manning the checkpoint seized two caliber .45 pistols, a homemade shotgun and several rounds of ammunitions from the suspects who were on board a silver gray Mitsubishi Pajero bearing plate number YBW 620. This brings to 96 the confiscated high and low powered firearms seized by the police since the start of election period aside from 43 pieces of bladed weapons, 9 hand grenades, 3 rifle grenades and other explosive devices, 5 gun replicas and over 500 rounds of various types of ammunitions confiscated in different police operations in the region.